Author contributions: Beresniak A developed the cost-effectiveness model; Caruba T and Sabatier B carried out the literature review and performed the cost study; Juillière Y, Dubourg O and Danchin N contributed to design the structure of the model and validated the model assumptions; all the authors contributed to review the manuscript. Supported by An unrestrictive grant from Sanofi-Aventis. The objective of this study is to develop a cost-effectiveness model comparing drug eluting stents (DES) vs bare metal stent (BMS) in patients suffering of stable coronary artery disease. Using a 2-years time horizon, two simulation models have been developed: BMS first line strategy and DES first line strategy. Direct medical costs were estimated considering ambulatory and hospital costs. The effectiveness endpoint was defined as treatment success, which is the absence of major adverse cardiac events. Probabilistic sensitivity analyses were carried out using 10000 Monte-Carlo simulations. DES appeared slightly more efficacious over 2 years (60% of success) when compared to BMS (58% of success). Total costs over 2 years were estimated at 9303 € for the DES and at 8926 € for bare metal stent. Hence, corresponding mean cost-effectiveness ratios showed slightly lower costs (P < 0.05) per success for the BMS strategy (15520 €/success), as compared to the DES strategy (15588 €/success). Incremental cost-effectiveness ratio is 18850 € for one additional percent of success. The sequential strategy including BMS as the first option appears to be slightly less efficacious but more cost-effective compared to the strategy including DES as first option. Future modelling approaches should confirm these results as further comparative data in stable coronary artery disease and long-term evidence become available. Core tip: The objective of this study is to develop a robust cost-effectiveness model comparing drug eluting stents (DES) vs bare metal stent (BMS) in patients suffering of stable coronary artery disease. DES appeared slightly more efficacious over 2 years (60% of success) when compared to BMS (58% of success). Mean cost-effectiveness ratios showed slightly lower costs per success for the BMS strategy (15520 €/success), as compared to the DES strategy (15588 €/success). The sequential strategy including BMS as the first option appears to be less efficacious but more cost-effective compared to the strategy including DES as first option. Coronary heart disease is an important disorder in Western industrialized societies, with regard to both the epidemiologic and economic burden of illness. Stable angina (SA) is a clinical syndrome subset of the acute coronary artery disease (CAD), which is a major cause of emergency medical care in developed countries. The prognosis of SA is highly variable and depends on the initial treatment strategy which could be invasive (surgical procedure) or conservative (medical management). Angiographic and angioscopic studies suggest that CAD often results from the disruption of an atherosclerotic plaque and a subsequent cascade of pathological processes that decrease coronary blood flow. A modern therapeutic strategy consists of coronary interventions and the implantation of drug-eluting vascular stents. The idea that devices could be placed inside the arteries to maintain the blood flow came to a reality in 1986 when the first stents were successfully implanted in coronary arteries[2,3]. The technology evolved rapidly even if the incidence of in-stent restenosis was between 20% and 30%. Then different generations of Drug Eluting Stents (DES) from heparin coated Palmaz-Schatz stents to chemotherapeutic releasing agent or copolymer coating have been proposed to lower the incidence of restenosis. Because of their high efficacy and good safety profile, DES is reported to be used in 45% to 80% of all percutaneous coronary interventions[6,7]. However, clinical evidence of medical devices is not really supported by robust randomized control clinical trials such as for pharmaceutical agents. Furthermore, cost-effectiveness of such strategies is rarely fully documented and based on numerous assumptions, making difficult the full evaluation of such strategies. Recent studies have continued to show improved procedural and clinical outcomes with DES both in the setting of acute coronary syndromes and stable coronary artery disease. A recent meta-analysis published by Palmerini et al analyzed twenty-two trials involving a total of 12453 patients and established that at one year DES were associated with lower rates of cardiac death or myocardial infarction and stent thrombosis than bare metal stents (BMS). Peterson et al studied the medical costs and outcomes of coronary stenting vs simple balloon angioplasty and estimated that the mean in-hospital cost for stent patients was $3268 higher than for those receiving coronary angioplasty ($14802 vs $11534, P < 0.001). However, stent patients were less likely to be re-hospitalized (22% vs 34%, P = 0.002) or to undergo repeat revascularization (9% vs 26%, P = 0.001) than coronary angioplasty patients within six months of the procedure. A South Korean cost-minimisation model established that DES resulted in higher costs than Bare metal stent by 985 Euros per patient. However, it is possible that some selection bias influenced the results of such studies based on descriptive clinical data sources. A United States study published by Amin et al specifically focused on DES indications in current practices and concluded that the use of DES in the United Sates would vary widely among physicians, with only a modest correlation to patients’ risk of restenosis. Thus less DES used among patients with low risk of restenosis would have the potential for significant cost savings for the United States health care system while minimally increasing restenosis events. As large controlled clinical trials are very difficult to implement in this indication, a modelling approach would allow to generate robust comparative results and assess the value for money. The objective of this study is to develop a cost-effectiveness model comparing DES vs BMS in patients suffering of stable coronary artery disease according to the French health system. 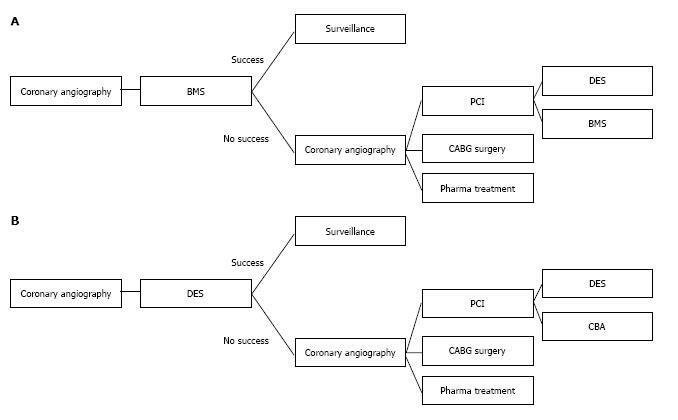 Given the scarcity of head-to-head clinical trials, there is a need to use decision analytic models to assess and compare expected costs and effectiveness of percutaneous coronary interventions (PCI) strategies, using published evidence and cost estimates. Hence, evaluating the cost-effectiveness of a therapeutic sequence may identify the most clinically suitable population for a new strategy, and the most effective and cost-effective treatment sequence. A model is a mathematic formula linking different variables to generate results relevant to a given environment based on local medical practices. A cost-effectiveness model is classically composed of a framework structure populated with costing and effectiveness data. Best modelling practices suggest that data populating a model should be based on relevant costs and existing published clinical data at the time of model development. The model assumptions should also be validated by expert clinicians according to their current medical practice in a given country. Specific to stable coronary artery disease management, results generated by such modelling approach provide unique information on the expected effectiveness, overall costs and cost-effectiveness of different PCI strategies to assist medical decision-making as well as resource allocation decisions. French direct medical costs were derived from a standard costing approach performed with a panel of three expert clinicians highly experienced in CAD management. Direct medical costs were estimated per 12 mo considering ambulatory costs (GP visits, cardiologist visit, laboratory tests, imaging, drugs) and hospital costs (percutaneous intervention, coronary artery bypass graft, coronary angiography alone, hospitalization due to complications), while initial diagnostic costs were not considered. Unit costs of interventions were derived from Diagnosis Related Groups list and from the national payer perspective for ambulatory costs. Item costs were collected from minimum and maximum costs. Costs are reported in Euros (2012), and the charge table is reported in Table 1. Table 1 Charge table (i€). DES: Drug eluting stents; BMS: Bare metal stent; PCI: Percutaneous coronary interventions; CABG: Coronary artery bypass graft; ACE: Angiotensin-converting-enzyme; ECG: Electrocardiogram. Resource utilizations were assessed from existing clinical guidelines. In the absence of guidelines, expert opinions were used from the clinician co-authors (YJ, OD and ND). Guidelines used were: “diagnosis and management of patients with stable ischemic heart disease” (American Heart Association 2012), “acts and services of long-term disease coronary heart disease” (Haute Autorité de Santé 2012) and “guidelines on the management of stable angina pectoris” (European Society of Cardiology 2006)[15-17]. Treatment costs include a combination of drugs prescribed to every patient (low-dose aspirin, statin and angiotensin-converting enzyme inhibitor) and specific costs of the selected treatment. When the options are “PCI with BMS” or “PCI with DES”, specific costs are associated with hospitalisation costs required for the angioplasty, the number and type of the implanted stents, and the costs of clopidogrel prescription to prevent intrastent thrombosis. Costs for the hospitalisation are determined using the French official hospital information system according to the specific diagnosis-related groups (DRGs) named “PCI without myocardial infarction”. DRG costs include treatments and all examinations (invasive or non-invasive cardiac investigations, biological analyses, etc.). Total costs of stents are calculated according to the average number of stent implanted per patient: 1.6 per patien. The therapeutic option “drugs” includes the costs of basic drugs (see above) plus either β-blockers, calcium antagonists or long acting nitrates. Costs of follow up after a clinical success include costs of ambulatory medicals visits, lab and medical imaging. The number of medical visits during follow-up has been estimated to 3 per year for GPs and 1 for specialist (cardiologist). Medical imaging includes one echocardiography and one myocardial scintigraphy. Lab tests (2 per year) include fasting lipid profile, including total cholesterol, low density lipoprotein (LDL), high density lipoprotein (HDL), and triglycerides, fasting glucose, full blood count including haemoglobin and white cell count, and serum creatininemia. Cost of follow up after a clinical failure are similar to costs after a clinical success plus one specific hospitalisation for management of the clinical failure. As no specific DRG exists for clinical failure, the following DRGs were considered: “myocardial infarction”, “angina”, “chest pain”, “coronary atherosclerosis” and “arrhythmias and cardiac conduction disturbances”. When a coronary angiography is not followed by an intervention, but by a drug prescription, the costs of the DRG “intravascular diagnostic procedure” have been used (mean costs of 5 related DRG). One relevant effectiveness endpoint aligned with stable coronary artery disease treatment goals has been used and expressed as treatment “success rate”. The success endpoint was defined as the absence of a MACE (major adverse cardiac events), that is to mean the absence of death or non fatal myocardial infarction or the need of a subsequent revascularization. Effectiveness estimates of PCI were derived directly from published clinical trials at the time of model development. Assuming comparable patient populations, probabilities of patients in success at each simulated 12-mo time point have been estimated from an extensive literature review. If different values are presented in different publications, expert opinions were used to validate the use of a range between the minimum value and the maximum value observed in the literature. When no relevant values have been reported in the literature, a range of potential values is estimated based on the clinical experience of the expert panel. Then 10000 Monte-Carlo simulations were carried out to screen every possible value according to a uniform distribution shape. Effectiveness values are presented in Table 2 for the DES strategy and Table 3 for the BMS strategy. Table 2 Effectiveness data of drug eluting stents model. DES: Drug eluting stents; PCI: Percutaneous coronary interventions; CABG: Coronary artery bypass graft; CBA: Coronary balloon angioplasty. Table 3 Effectiveness data of bare metal stent model. DES: Drug eluting stents; PCI: Percutaneous coronary interventions; CABG: Coronary artery bypass graft. Using a 2-year time horizon, two PCI simulation models have been developed: BMS first line strategy (Figure 1A) and DES first line strategy (Figure 1B). The first step of the BMS model is the coronary angiography, followed by bare metal stent. After one year, patient could be in clinical situation of success or failure. In case of success, the surveillance without new treatment will occur during the second year. In case of failure at the end of the first year, a new coronary angiography will lead to either a PCI (either bare metal stent or DES), a Coronary Artery Bypass surgery (CABG), or a pharmaceutical treatment. The first step of the DES model is the coronary angiography, followed by DES. In case of success, a simple surveillance is proposed as in the first model. In case of failure, a new coronary angiography will lead to either a PCI (new DES or balloon alone without any stent), a CABG, or a pharmaceutical treatment. Figure 1 General architecture of the bare metal stent (A) and drug eluting stents (B) sequential model. DES: Drug eluting stents; BMS: Bare metal stent; PCI: Percutaneous coronary interventions; CABG: Coronary artery bypass graft; CBA: Coronary balloon angioplasty. The models were specifically programmed in D-script language (Vanguard Studio 5.2). To manage uncertainty, and as per best practice in economic modeling, 10000 Monte-Carlo simulations generated mean values and standard deviations of the sub-model outputs: costs, effectiveness, and average cost-effectiveness over 2 years. Monte Carlo simulations consist of a class of computational algorithms that rely on repeated random sampling to compute their results. 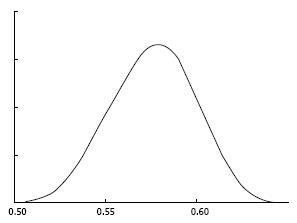 This approach, also called “probabilistic sensitivity analysis”, allows screening all possible values of a given parameter according to a defined distribution shape and to recalculate the results. For the purpose of this study, uniform distributions have been programmed between minimum-maximum ranges of values. 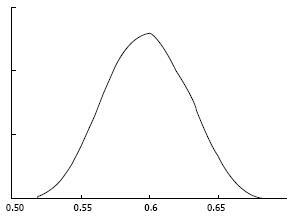 Therefore, the models were able to construct distributions of results which are presented with their standard deviations (SD). Statistical tests (two groups mean tests with known variances deducted from cost-effectiveness SD) were performed to calculate potential significant differences between cost-effectiveness ratios of treatment strategies. Using stable coronary artery disease management medical costs, cost of interventions and pharmaceutical therapies and published effectiveness data, the models generated the overall treatment costs over 2 years, the probability of success, and the cost-effectiveness expressed in cost per success. Strategy DES appeared slightly more efficacious (Figures 2 and 3) over 2 years (60% of success, SD 0.03) when compared to the strategy BMS (58% of success, SD 0.02). Total costs over 2 years were estimated at 9303 € (SD 3415) for the strategy DES and at 8926 € (SD 3778) for the strategy bare metal stent. Hence, corresponding mean cost-effectiveness ratios showed slightly lower costs per success for the bare metal stent strategy (15520 €/success, SD 6634), as compared to the strategy DES (15588 €/success, SD 5787). Incremental Cost-Effectiveness Ratio is 18850 € for one additional percent of success. Figure 2 Cost distribution shape of the bare metal stent strategy (X axis: % success rate; Y axis: Occurrence probability). Figure 3 Cost distribution shape of the drug eluting stents strategy (X axis: % success rate; Y axis: Occurrence probability). The model assumes a 12-mo treatment period prior to allowing a potential switch to the next potential intervention in case of treatment failure. This assumption is based on the fact that most clinical trials report effectiveness data at 12 mo time points. These assumptions could be further discussed but they appeared to be consistent with medical practices in France, as validated with the expert panel. Furthermore, the time horizon of the model is limited to 2 years in order to reflect the data available at the time of model development. Hence, no long term effectiveness assumptions were made, as is it often the case in published “lifetime” cost-effectiveness models in stable coronary artery disease. Wisløff et al carried out a cost-effectiveness model comparing DES vs BMS and concluded that DES was more cost-effective over a life time horizon using life years saved as an effectiveness endpoint. However, this model is based on life-time horizon projections speculating well beyond clinical trials evidence and diluting costs over years. Co-morbidity such as diabetes is a risk factor of re-stenose after stent implantation, particularly for BMS as confirmed by the meta-analysis of Bangalore et al carried out on 42 controlled randomized clinical studies. However, no specific calculations have been carried out for patients suffering of co-morbidities such as diabetes. Data inputs come from studies where proportion of diabetes patients were similar than European population, as described in the Euro Heart Survey. This approach does not capture potential Quality of Life (QOL) improvement, as we would recommend that such evidence be considered separately, to its full merit. Furthermore, it is not the purpose of one clinical indicator to capture all the dimensions of life, so QOL dimensions should be collected separately using appropriate validated instruments. Many published “cost-utility” models (often presented under the label of “cost-effectiveness” models) consider the use of Quality Adjusted Life Years (QALY) as “effectiveness” criteria in order to take into account both the Quality of Life and the survival perspectives. Not only the QALY approach is not specifically recommended in France (and several other countries such as USA and Germany) for methodological issues, but such approach reveals to be inconsistent in Stable coronary artery disease. This is because the results are directly dependent on how the utility scores have been derived, explaining the possibility of data manipulation and why these studies often lead to divergent results[41,42]. The advantage of cost-effectiveness models using clinical effectiveness outcomes (such as Success probabilities) from published clinical trials is that the effectiveness criteria are not further transformed into utilities. Hence, classic cost-effectiveness assessments (cost/clinical outcome achieved or per medical event avoided) generate more transparent and consistent results. Also, this cost-effectiveness analysis does not use a societal perspective but the perspective of the public payer in France. In such case, the results do not take into account the reported favourable impact of PCI on indirect costs. As indirect costs related to CAD are substantial and are estimated to be 2-3 times as high as direct costs, the results of this economic evaluation are likely to be understated. Finally, a frequent concern about cost-effectiveness models is that most publications seem to support the product of the study sponsor, suggesting a potential publication bias such as for publications of clinical trials. As they are used to inform and optimize resource allocation decisions, cost-effectiveness models are country specific and should always define the assumptions and conditions underlying the results where a therapeutic strategy is found to be cost-effective, which should also be in line with medical practices. Any model assuming very hypothetical clinical practices or theoretical outcomes should be considered with caution, as for any scientific studies. This sequential cost-effectiveness model proposes a new approach to assess complex strategies based on clinical evidence based data and avoids any extrapolation over time, which could be subject to criticism. The model outcome expressed in costs per clinical success appears to be a clinically meaningful endpoint, allowing to compare various strategies. The sequential strategy including BMS as the first option appears to be slightly less efficacious but more cost-effective compared to the strategy including DES as first option in the frame of the French health system. Future modelling approaches should confirm these results as further comparative data in stable coronary artery disease and long-term evidence become available, but also to assess the value of innovative strategies such as biodegradable coronary stents.